Developed by IGT, Double Diamond is about as basic as pokies can get, with just 3 reels, and a single payline running through the centre of them. Classic symbols of cherries, bars and 7’s fill much of the game, although the Diamond has some special qualities that will result in the biggest wins being paid out. This game looks old fashioned because it is, having been around at land-based and online casinos since the dawn of time, but just because it’s old doesn’t mean that it’s a bad game, as many people like the simplicity of just selecting a bet and spinning the reels to land regular wins and perhaps a big jackpot. Forget sophisticated animations, 3D effects and multiple bonus rounds, as Double Diamond is strictly focused on the important business of spinning up winning combinations and has very few features to distract players from doing just that. Above the main part of the game is a slightly ornate title and to the side of this are some decorative features, but the actual reels are set against a black background with just a few horizontal stripes across it to liven the design up. Underneath is the control panel, which is used to adjust wagers from a bare minimum of 0.40 per spin to a fairly substantial 500.00 and all points in between. An Autoplay option can set the reels spinning on their own for up to 50 times, although it’s wise to set win or loss limits that will stop these spins beforehand. Clicking on the paytable reveals how much players can expect to win each time the payline is filled with the right symbols, and wins are calculated as multiples of the total amount bet per spin. The smallest wins will occur when a single cherry lands on the line, on any reel. Players win 2x their stake back, while seeing 2 cherries stop on the line will be worth a prize of 5x. The black Any Bar symbol will also be worth 5x the stake when it fills the line, and then it’s back to the cherries, with a full row of 3 being valued at 10x. It’s on to the Bars now, with single, double and triples paying out 10x, 25x or 40x respectively when a single type fills the line, and the most valuable of the regular symbols is a big red 7 that will be worth 80x. While all of these wins will add to a players’ bankroll, what they will really want to see is the Double Diamond symbol that can pay out the jackpot prize and multiplies any other. If a single Diamond is on the line along with 2 matching symbols, it will act as a third example of the symbol and create a winning combination, while also doubling the amount returned to the player. For example, if 2 single Bars and the Diamond land across the line, players win 2x the amount they would get for just the single Bars and get paid 20x their stake. However, if 2 Diamonds and just a single example of any other symbol appear, the win is multiplied by 4x. It’s worth noting that cherry wins are also multiplied, even if just 1 cherry and 1 Diamond land on the line. Anyone who sees a full line of the Double Diamond symbol will have won the jackpot, with a prize equal in value to 1000x their stake. 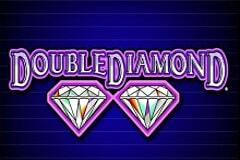 Nice, straightforward and simple gameplay are the reasons Double Diamond has remained popular for so long. The design isn’t complicated at all, and with just a single payline to concentrate on, it’s easy to see winning combinations spun up. It’s a pokie that will remind many players of the classic machines found in pubs and clubs worldwide, but can now be played from home through the many online casinos that have games and software from the trusted and reliable IGT company.